Dr. Cummins and Dr. Baffes have both been professors at the University of Western States for over 25 years and are involved in several clinical research projects. They are available in their private practice by appointment daily and have convenient evening and weekend hours. Feel free to call the doctors to learn more about the areas they specialize in. Dr. Cathy Cummins has several areas of focus in her practice. Since receiving her doctorate, she has taken over 6,400 classroom hours of postgraduate education. She is a Diplomate of the American Board of Chiropractic Orthopedists and is the past president of the American Board of Chiropractic Orthopedists. This board tests eligible candidates to receive their specialty certification in orthopedics. Cathy is also elligible for her certifications in sports medicine and had practiced for years as a CSCS (certified sports and conditioning specialist) working with many Olympic athletes. Dr. Cummins' practice has a focus in: sports medicine, orthopedics, radiology, geriatrics, the temporomandibular joint, headaches, whiplash, dizziness, sinus and ear conditions, disc herniations, veterinary chiropractic and women's issues. She also lectures around the country on topics such a geriatrics, therapy ball exercise programs, neck and TMJ diagnosis and treatment. Dr. Cummins has also published several articles and has contributed to several books. She has also reviewed and edited several chiropractic texts. 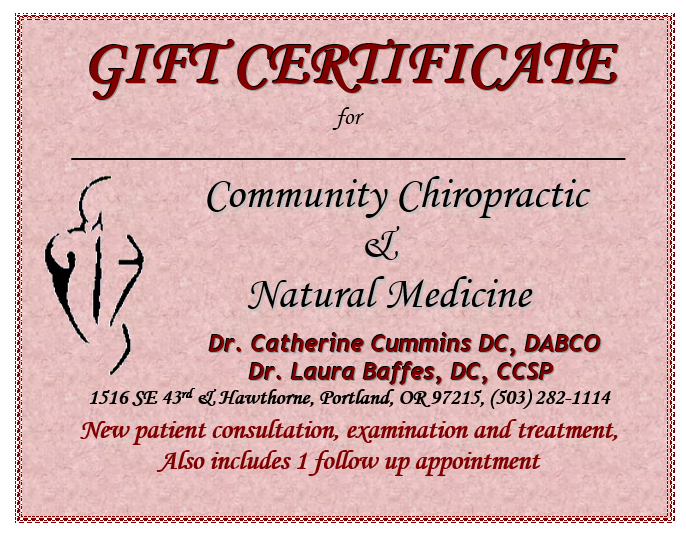 In 2000, Dr. Cummins was awarded with the "Outstanding Faculty Member" award from Western States Chiropractic College. She has published and been primary in two federally funded research projects, exploring how chiropractic care benefits the TMJ and headache patients. Cathy's interests include the martial arts (she hold 5 black belts), singing barbershop, pottery, gardening and her animals. Recently, Cathy was the women's alternate on the 2014 USA Paralympic Curling team for Sochi. My dogs Tigger and Trek, singing lead in a barbershop quartet, rose gardening, judo, sculpture, photography and my family. - Case studies: Intra-articular fractures: Diagnosis and Management. Research: Consultant Research Grant proposal with the WSCC research department on Physician assisted vs. independent study of a geriatric education manual. Research: Created & Writing and Participation as chiropractor Research Grant proposal with the WSCC research department on Headache. Research: Consultant Research Grant proposal with the OGCE on geriatric care.